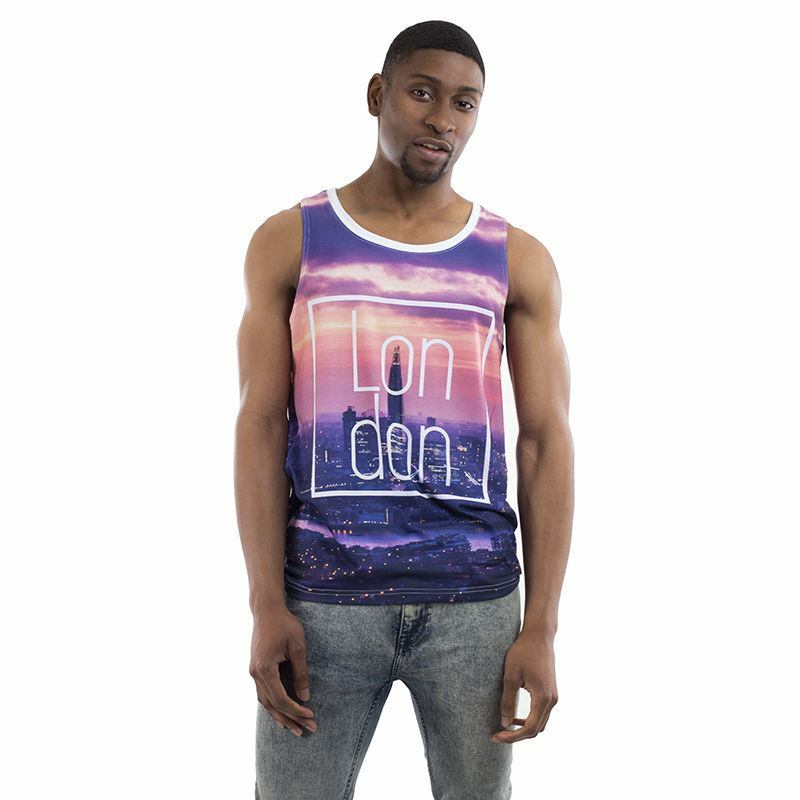 Look hot and stay cool in your very own personalised vest top. Printed with your photos, logo, name or designs, you can create a one of a kind piece of apparel for sport, summer or street fashion. Wear one to the gym to look and feel good, or update your team's kit with individually personalised vests. Available in three sporty fabrics and eight sizes including plus size vest. Whether you’re pumping iron in the gym or posing by the pool on holiday, this custom printed vest top will keep you cool. Fully customisable for a truly bespoke design, you can print on the front, back, neck rib and even design your own clothing label. Very nice quality of this training T-shirt. And I love the design, of course. I´m very satisfied with the item. Sleek and floaty with a subtle shine, this is a loose fabric in nature. Come rain or shine, this all-weather breathable fabric will keep you comfortable. Resistant to shrinking, over-stretching and creasing. Care: Machine wash at 30°c. Quick hang dry or medium tumble. Iron and steam safe. Do not wring. Our Bounce Cotton Jersey is moisture wicking, drawing sweat away from your skin. It has a good stretch with a matt finish. Some shrinkage will occur on the first wash, so bear this in mind when choosing your size. As our Cotton Jersey is made of a natural cotton it has a slightly off-white base tone, giving slightly muted colours in comparison to the other jerseys. This gives your t-shirt a completely different, authentic look. Care: This fancy fabric needs a little more TLC. Wash inside out at 30°c and hang dry. Iron safe. Dry cleaning safe. Do not put in the tumble dryer, wring out, steam or soak. The pique knit gives this fabric its unique holes and airflow characteristics. It has a slight sheen and mesh-like quality, making it super breathable. If you’ve already got a clothing line or aspiring to create one, these vests are a great addition to your apparel collection. Customise the label with your logo, product name, size or special message for a great personalised gift. Like many of our products, the ‘design your own vest’ comes with a quantity discount, so get one for the whole squad and save money. Your design is printed onto the fabric by our expert technicians using the most up-to-date printing techniques. Once printed, skilled craftsmen will cut each individual panel for you personalised cut and sew vests. Printing first ensures that the design runs from edge to edge. When each individual panel is complete, our trained seamstresses will stitch it all together before it is fully checked over at quality control. You can design the front, back, neck rib and custom label, so if you’re part of a sports team, this is the ideal way to get your kit looking fresh. Add a contrasting colour to the neck rib for a cool effect. Print your club’s emblem on the front, and each player’s name and number on the back for a unique kit design. With the customisation features, you can create standout vests that good on and off the court. Create your own personalised vests for your holiday and really make an impression. Express your style poolside, beachfront or out on the town with a unique design. For a stag do, get the squad together and print your nicknames or create a photo collage vest featuring all your awesome nights out. The breathable properties make these vests ideal for the gym, but don’t just rely on your music playlist to motivate you. Find your favourite exercise quotes and emblazon them all over your custom vest. You might even inspire your fellow gym goers.